Incorporated in 2007, INVESTOC is a Portuguese Family Office operating in asset management through investment in different sectors and the development of projects in new business areas through the different Group companies. With exclusively private capital, INVESTOC operates in several business areas, but its real estate investment has been a fundamental area since the Group began operating and one which its consolidation and growth strategy is based on, through its holding, Osório de Castro – Investimentos Imobiliários, S.A. 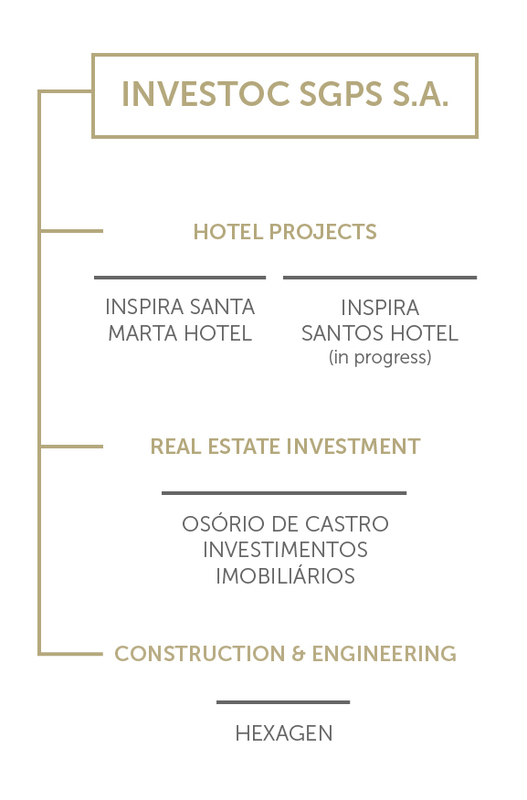 The Group’s other business areas are Hotels, through the Inspira brand, with a hotel in operation – the Inspira Santa Marta Hotel in Lisbon and Construction and Urban Regeneration with Hexagen. Apart from these four areas, the Group remains attentive to the diversification of its business areas and the study of new opportunities and projects that could bring synergies and complementarity to its main and current areas of operation. Based on solid values and promoting a policy of economic, social and environmental sustainability, running through all its projects, INVESTOC seeks to invest in different products, which boost the creation of value for the shareholders.